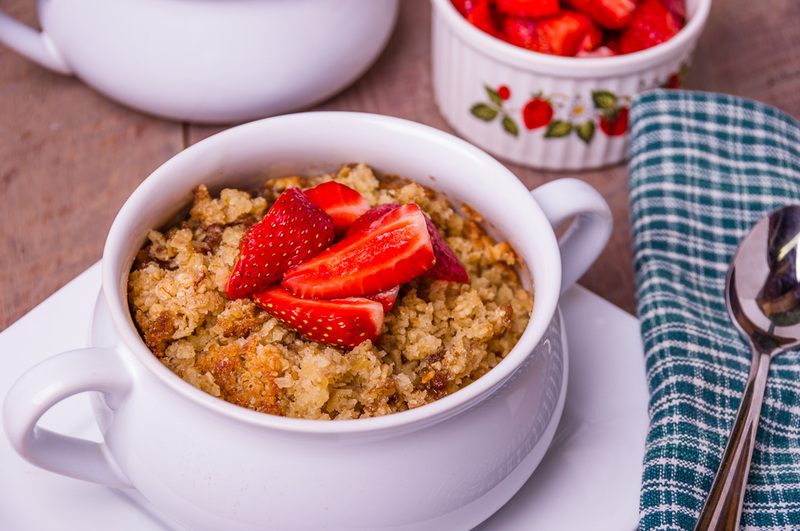 My favorite morning meal this time of year when the strawberries are Fresh From Oregon is Baked Oatmeal. This is not the typical oatmeal you may be used to, it is a fluffy brown bowl of oatmeal that tastes like you are eating an oatmeal cookie. The only oats I use in my oatmeal is Bob’s Red Mill and they are made right here in Oregon. Bob’s Red Mill Whole Grain Store and Visitors Center is located just 15 minutes from Portland, Oregon. As you arrive at the store you will see it is a big red barn with a large water wheel out front. When you enter the store you will see rows of Bob’s Red Mill products, bulk foods, kitchen essentials and more. You will also get the great aroma of fresh baked bread and more coming from their kitchen. So if you are not from Oregon and ever come for a visit this is a must see stop you need to add to your list. If you can not get to the store you can get everything online and shipped right to your house or check their store locator to find a store near you that carries their product. In large bowl beat together the oil and sugar with a hand whisk. Mix in eggs and milk until combined. With a large spoon add the oats, salt and baking powder, mix well. Spray 4 small casseroles dishes with baking spray and divide oatmeal mixture evenly between dishes. Divide the brown sugar and cinnamon and sprinkle over top of each oatmeal. Cover each with foil and place in refrigerate at least 8 hours or overnight. This is a must the oatmeal needs time to absorb the liquid. Preheat oven to 350 degrees. Baked covered for 20 minutes, remove foil and bake another 15 minutes and remove from the oven. Let set 5 minutes and with a fork mix the outer part of the oatmeal with the center part. Top with your strawberries or any fresh fruit and enjoy! This also freezers well, I portion it into small freezer containers and place in the freezer for up to 3 months (If it lasts that long.) The night before I place it in my refrigerator to thaw. The next morning put the oatmeal in a microwave safe bowl add just a little milk to moisten and cover with some plastic wrap. Heat for 30 seconds, give it a stir and heat for another 30 seconds. Fluff with a fork and it is ready to enjoy.